The XBee directly drives a simple numeric display, and that’s often all a project needs. With a simple 7-segment numeric display you can showhow many, how much, which one or when with precision. 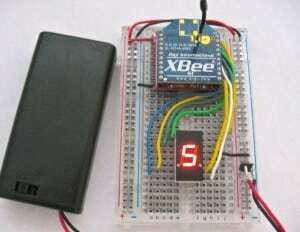 It’s a snap to display numbers wirelessly with an XBee radio. Now you can create a counter that shows how far away Friday is, display your current Amazon or Yelp ratings, show the current flight landing at O’Hare or keep an eye on the temperature in your restaurant’s walk-in freezer.